November 3, 2016 October 30, 2016 / Elizabeth T.
As with every month’s end, I’ve rounded up some of my favorites, so without further ado, let’s jump right in! First up is this Aloe Vera Moisture Real Soothing Gel by Welcos Kwailnara. As you’ve probably seen from my posts here and here, you know how much I love aloe vera gels because they’re the perfect soothing skincare product when everything’s going wrong, and the skin is acting up and not working with any other products. Since it’s officially fall now, the weather in LA has been a little drier than usual, and I can feel how parched my dehydrated skin is, especially after a long day in the office’s air-conditioned space. At the end of a stressful day, I love lathering on a layer of aloe vera gel on top of my normal skincare routine as a sleeping mask, and I always wake up to glowing and healthy-looking skin! What makes this gel stand out from the rest is that it’s alcohol-free and made of 98% organic aloe vera, cucumber extract, and vitamin E, which will sooth sensitive, irritated skin. 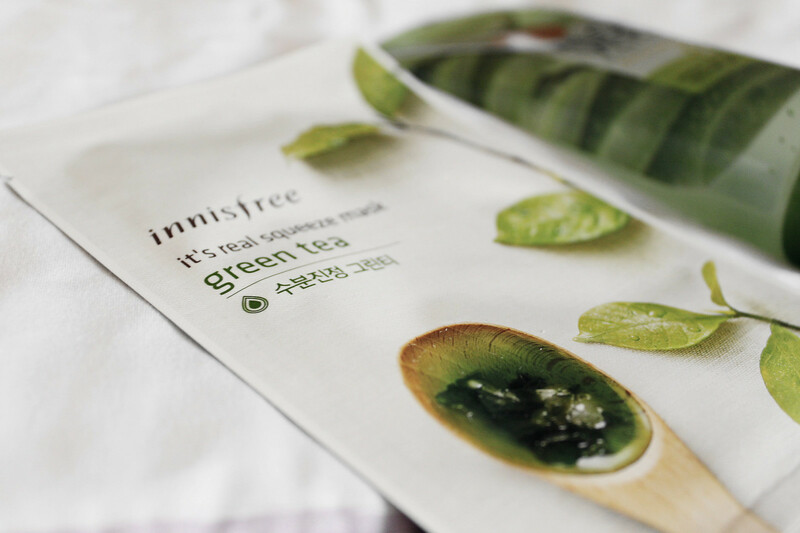 Another skincare product that I’ve been obsessed with this month is definitely this Green Tea Sheet Mask from Innisfree. As you all probably already know, I’ve been obsessed with sheet masks since I was in high school because they’re such a convenient and easy way to achieve beautiful skin overnight. 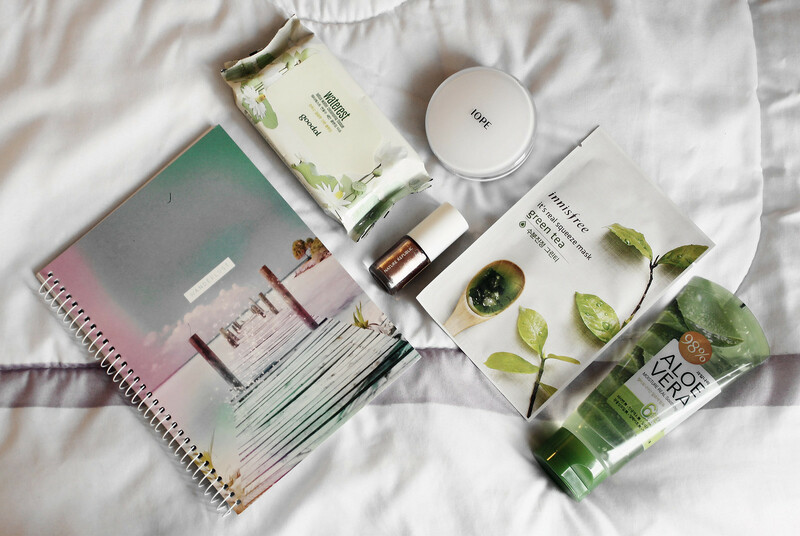 This green tea one is perfect for days that my skin’s feeling extra dry or sensitive, so I’ve been using it frequently this past month since the fall weather has been taking a slight toll on my complexion, making it a little duller than normal. 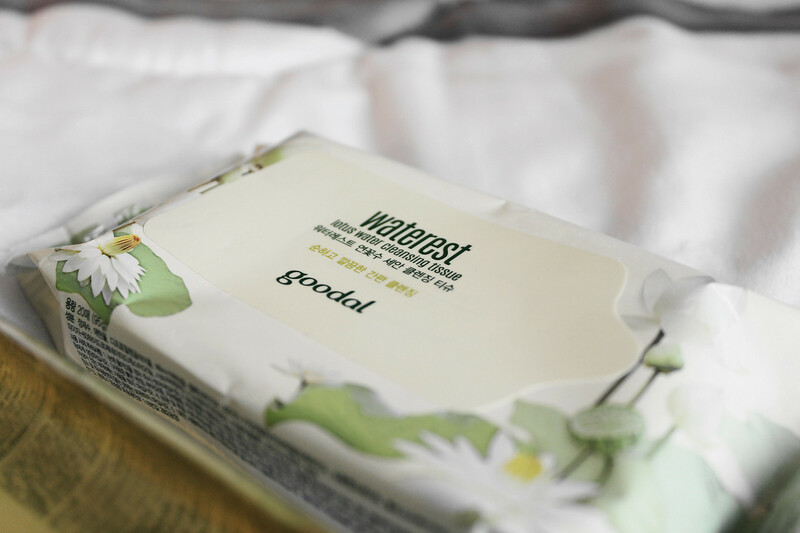 Aside from these skincare essentials, I’ve also been loving these Waterest Lotus Water Cleansing Tissues by Coodal. I love having makeup wipes in my cabinet as a fail-safe, for those nights when I get home too late but still need to remove my makeup properly. 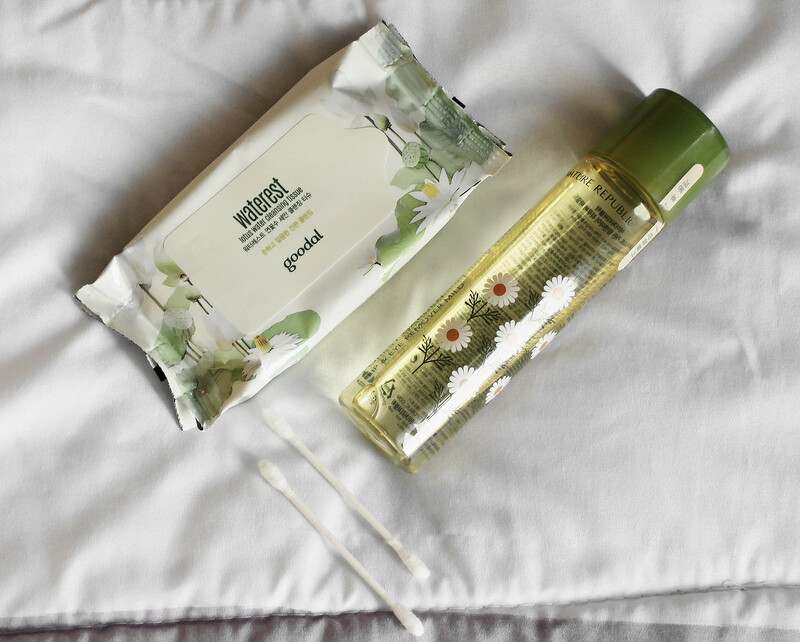 These lotus water cleansing tissues are non-irritating, and I love how effective they are! They’re the perfect way to end a long day, so you can take off all of the dirt, grime, and makeup from your skin, prepping it for cleansing. Since it’s the winter, my skin’s been drier than usual, and I’ve switched up aspects of my makeup, most notably, my base makeup routine. 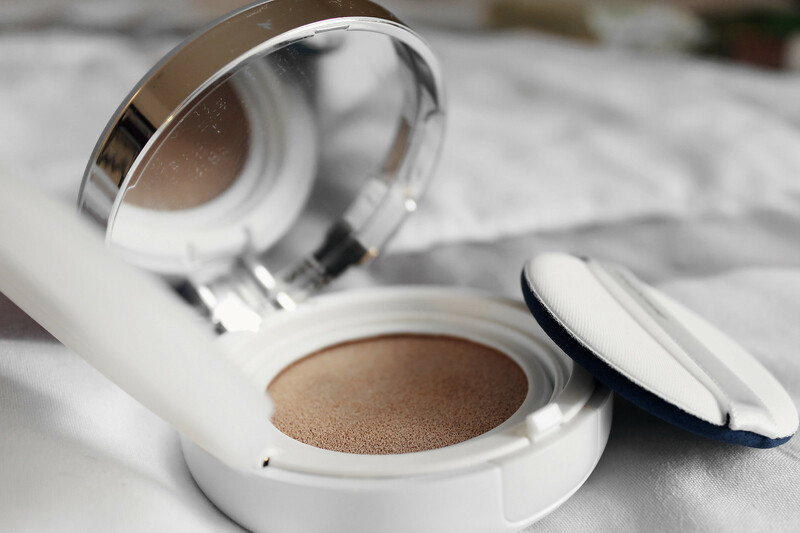 I love BB creams and cushion compacts, with some of my favorites being Skin79’s VIP Gold BB Cream and Innisfree’s Ampoule Cushion Compact, but I’ve been reaching for my IOPE Air Cushion more and more lately! 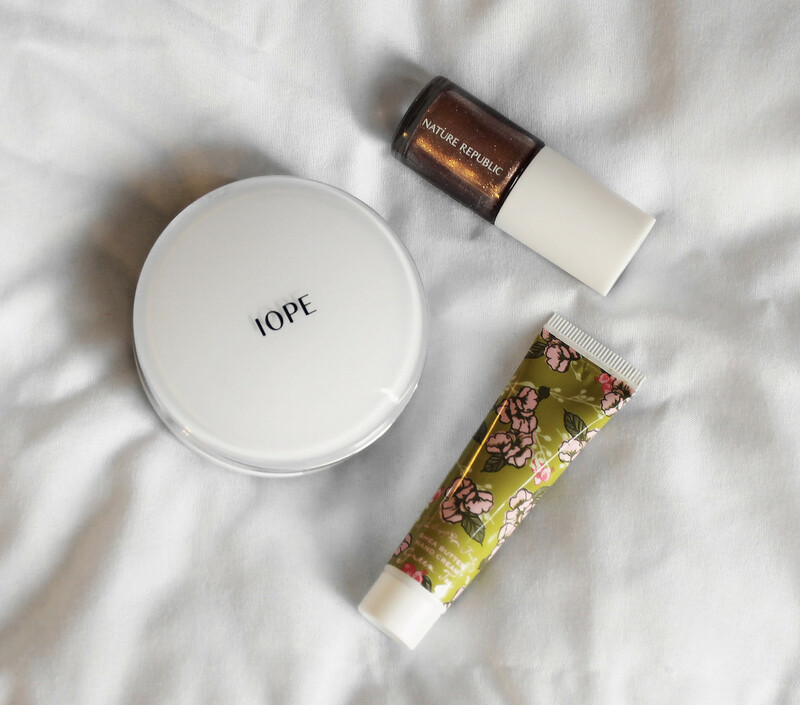 🙂 Though the other products that I regularly use provide ample moisture, this IOPE cushion is more watery than most of my base makeup and really helps to create a healthy glow to the skin that makes me look so radiant and youthful! Following up other with beauty products, this Rosy Gold Dress Nail Polish from Nature Republic has been my go-to color for the past few weeks. Not only does it perfectly match my new rose gold iPhone 7, the elegant color is perfect for the end of the year, especially as the holiday season approaches. It adds just the perfect touch of sparkle to just about any outfit, don’t you think? 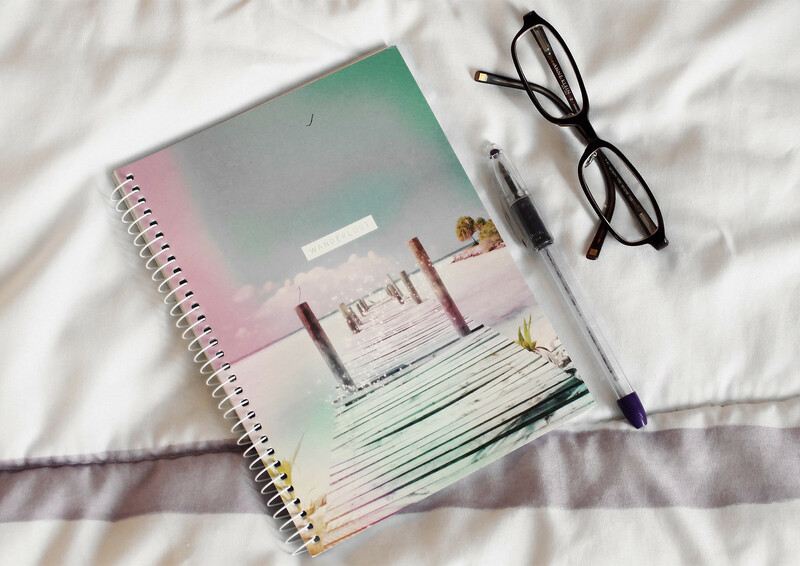 And last but definitely not least, I’ve been loving this ‘Wanderlust’ Notebook by Typo so much lately! I have a habit of keeping a notebook by my side, to jot down all of the things that I need to do in the day, and this ‘Wanderlust’ notebook is perfect during the colder months because the beautiful colors and beach-themed cover provides the perfect imaginary escape (especially when I’m sitting in an overly-air-conditioned office with nowhere to look but out the window at the clouds). That concludes my favorites for the month of October! What were some of your faves this month? Let me know in the comments below because I always love hearing from you all! Wishing you a lovely November! Thank you so much love ❤ 🙂 Yes, their notebooks are the best! Thank you so much love ❤ 🙂 Notebooks are my favorite! I love using air cushions too!! they are so easy to apply, and I love how light it feels, but it still gives you that glow 🙂 The Aloe vera soothing gel sounds amazing, my skin has been really dry lately too. I would love to try that..Have a great week Elizabeth! Yes, air cushions are my favorite too! ❤ 🙂 They're very natural! And the aloe vera gel is amazing too! You should definitely give it a try! Hope you're having a great weekend Tiffany! Love all your favorites! Especially that IOPE cushion! Thank you so much love ❤ 🙂 The IOPE cushion is one of my favorites! Wow that looks incredible! need to try! Thank you so much love ❤ 🙂 Hope you'll get to try these one day Carmen! Thank you so much love ❤ 🙂 The green tea mask is my favorite! Nice products. I like you nail polish, so pretty shade. Thank you so much love ❤ 🙂 Glad you liked it! Such a great roundup of favorites! I’ve never really used aloe vera gel as a moisturizer for winter but that sounds like such a smart idea b/c it is the driest time for skin. Thanks for tips! Thank you so much love ❤ 🙂 And yes, aloe vera gel is a great supplementary product for days that your skin is really parched and dry! OMG yess I love Korean skincare products and the aloe vera gel seems like something I’d love to try. I actually currently use the Nature Republic one and I love to use it on a daily basis to soothe my sensitive acne-prone skin. P.S. So sorry, but could you delete my previous comment? I accidentally pasted information when I was writing back an email to a sponsor. Yes, Korean skincare products are the best ❤ 😀 I've used the Nature Republic aloe vera gel, and I love it as well! And of course, it should be deleted now! Let me know if it worked or not 🙂 Thanks for stopping by love! Hope you're having a great weekend! Ahh… the notebook! The cover looks so nice! Yes, notebooks always get me too haha! 😀 And air cushions are so convenient, aren’t they? ❤ Thank you so much for stopping by Elise! 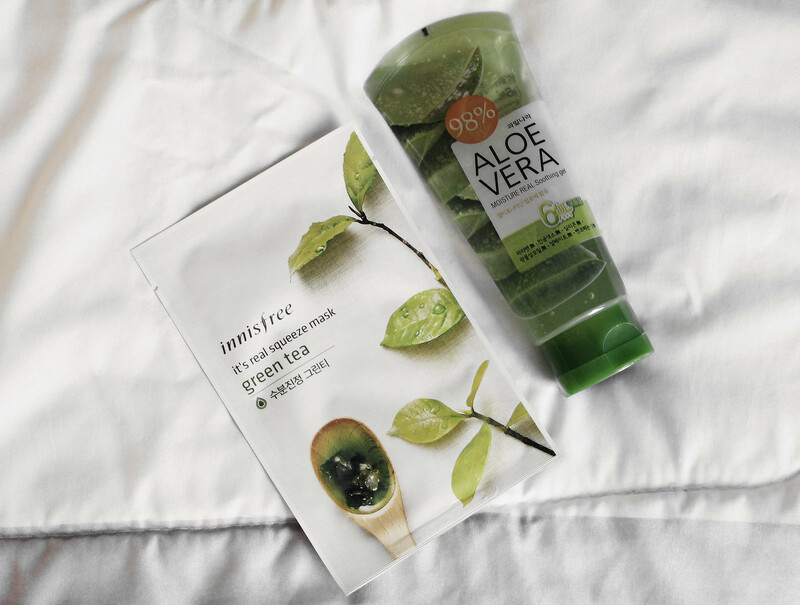 I love products made of Aloe Vera and green tea. Thank you for sharing! These all look so good! Love the little notebook! Thank you so much Annabelle ❤ 🙂 Glad you liked the post! Yes, it’s amazing! 🙂 ❤ Thank you so much for stopping by Erin! Aren’t they amazing? ❤ 😀 Thank you so much for stopping by Mariann! Thank you so much love ❤ I agree! 🙂 Love Innisfree!